Update 04/22/2011: Drove by today and the bear was no longer in the window. One of several statues of local celebrity Samson The Hot Tub Bear painted by local artists and set to debut in the May 12th parade celebrating the 125th birthday of the City of Monrovia. The parade theme this year is "Cruisin' With Samson". (The date on the city website is incorrect - Thursday is the 12th). 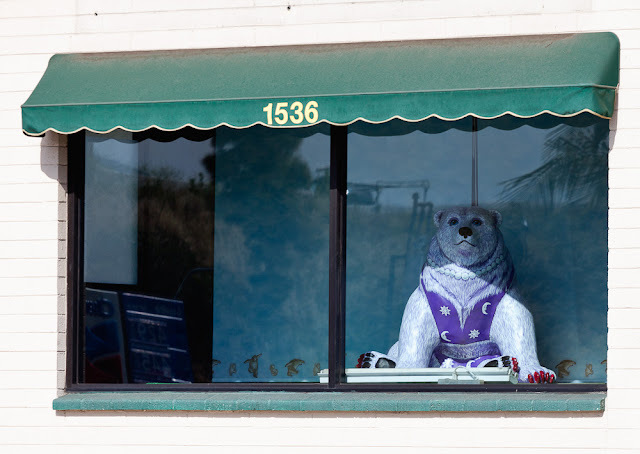 The bear above was purchased by Creative Woman - Wizard of Bras and can be seen in the front window facing Myrtle Avenue at 1536 S. Myrtle Avenue. This is the building next door to the south of the Creative Woman store. Since I don't think Samson wore pearls, I believe they named this bear "Delilah". I like the little dancing bears on the bottom of the wall in the background - nice touch.